I've got the deck of the Eastern Arctic Kayak (EAK) set up. Beam is something like 29 inches at 90 inches from the stern. 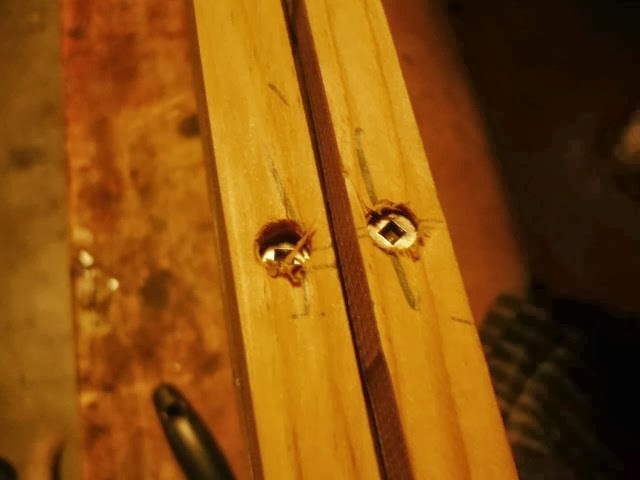 I figured that the first three feet of the boat weren't in the water so I would put the widest part of the boat more or less in the middle of the part that was in the water which worked out to be at about 90 inches from the back. View from the bow end. There's a windlass just back of the bow to pinch in the sides. 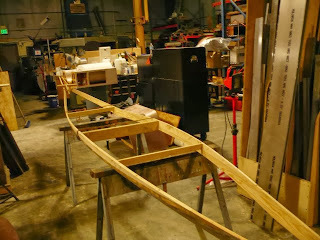 Aside from the coils of rope that hold the ends together, three spreaders fix the shape of the deck. 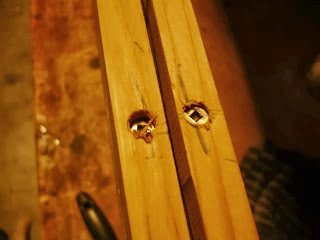 The middle of the three spreaders fixes the beam. The other two spreaders widen the deck by some amount fore and abaft the middle spreader. Here's an oblique view of the deck, this time from the left rear toward the bow. The bow rises and the stern drops. The deck turned out pretty symmetrical, something that sometimes takes some struggle to achieve. 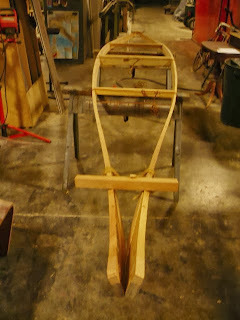 But I cut both gunwales from the same piece of lumber that had been laying outside for about a year, giving it time to stabilize from its green state when I bought it, so perhaps I shouldn't be surprised that it turned out. When it comes to something like the gunwales, what matters is the shape and not the details of how the shape is achieved. I used to think that these things needed to be done in a traditional manner like with doweled scarfs and no glue or screws, but then doweled scarfs were not particularly traditional anyway. Much of what we think of traditional kayak building technology evolved in post contact times, that is, post contact with European traffic which introduced both new materials and tools. The only truly traditional part of kayak building is to do the job the best you can with the tools and materials available to you.